DM have "leaked" pics of Shannon & Connor on a date (Kudos to whoever it was that sleuthed Connor as a contestant - can't remember who sorry!). Shannon seemed very single when I briefly sleuthed her IG post-show so don't think it panned out with anyone. Shame, I was hoping for a Jules/Shannon romance. @Storybook wrote: I agree with everything you said @Bobette. Channel 10 finally deserve an award - for producing the most hyped up, drama-filled, trashy, non-romantic television show! Ugggh yep and the IG caption "prepare for turbulence" makes it clear what the focus of this dud season will be IMO. It'll probably be less "turbulence" and more "crash and burn". At least MAFS had Cam and Jules. 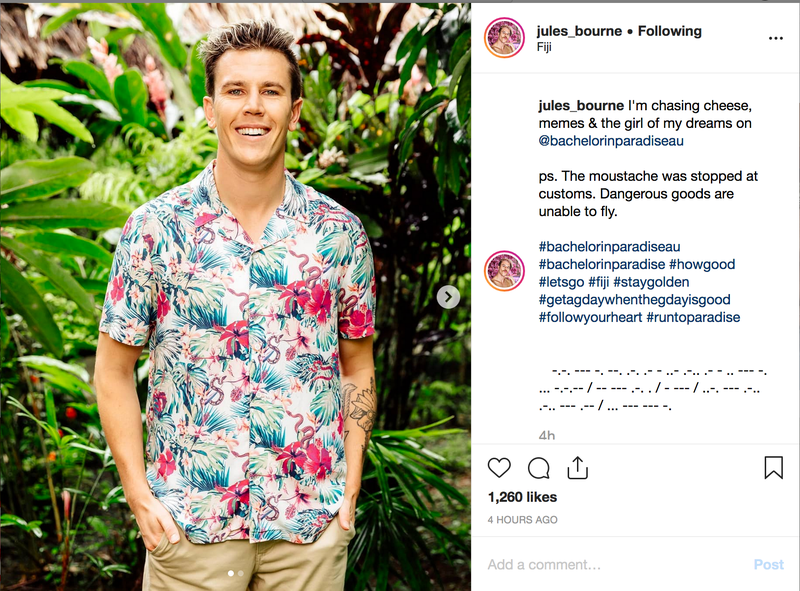 BiP2 seems to have produced zero genuine couples - not a great strike rate for a supposed dating show. I just really want to get it over with tbh. I feel like the media are sitting on pap pics of Matt's season while they focus on boring BiP drama. BOO! Not shocking at all. If something so trivial is being built up as some kind of scandalous revelation, this season could be even more boring that I feared. Wake me when it's over! Attention please Jules arrives tonight and even though I fear he is headed for heartbreak I am choosing to be excited. Also he posted a message in morse code on IG and yes I translated it because I'm a massive nerd and couldn't resist. "Congratulations! More to follow soon"
Yay for Jules! And yay for no moustache! @Dirty Street Pie wrote: Yay for Jules! And yay for no moustache! I miss the pornstache but clean shaven Jules is better than no Jules so I'll take it. He's the only person there I'm interested in watching to be honest. I definitely got the feeling post-show he was heartbroken; I wonder who crushes him? Flo? Shannon? I love Gogglebox so much. @Bobette wrote: I love Gogglebox so much. @HodanG I agree she's the best option for him at the moment but just so young in both years and mentality IMO and I'm not sure I could see it lasting long term. TPTB may want them to get to the end to offset Bill and Alexnation, and Cass has been at the top of the "finding love in paradise" section on Sportsbet since filming started so it looks like she ends up with someone, but I'm not convinced it's Richie, and if it was I'd expect him to be higher. Nathan is the bookie's favourite to find love and with Vanessa gone the screenshots of him must be with Tenille so I assume they'll be another finale couple. SM strongly suggests USAlex ends up with Caroline Lunney (which could explain Brooke's tears in the season preview IMO) and Shannon and Connor got F1-sh music last night which suggests to me they also make it far (note to self: need to suss out Connor's SM for clues). ...and then Cass - mystery man.